The Philippines is blessed with many travel destinations. Each island has something to offer, waiting to be discovered by some intrepid traveler. Most of all each discovery tends to linger in one’s memory. On the northern part of the archipelago lie its biggest island, Luzon and its numerous mountain ranges inhabited by several religious, industrious tribes. Centuries of their culture and work produced the Banaue Rice Terraces, a prominent travel destination worldwide. While some parts have fallen to modern civilization with concrete fences supporting terraces, they have still retained their ancient wonder that it is considered a must-see travel destination. Just near the lower end of Luzon, lies another important travel destination, Mayon Volcano. Straddling southern towns and often spewing ash or causing minor tremors, this active volcano has retained its near-perfect cone shape just like its more popular cousin and Japan’s famous travel destination, Mt. Fuji. The province of Bohol lies near the heart of the Philippines. It is the home of one of the world’s smallest primates, the Philippine tarsier (Tarsius syrichta). Its most famous travel destination is the Chocolate Hills which earned its name when they turn chocolate brown at the end of the dry season. Bohol is also a travel destination because of its beautiful white sand beaches. 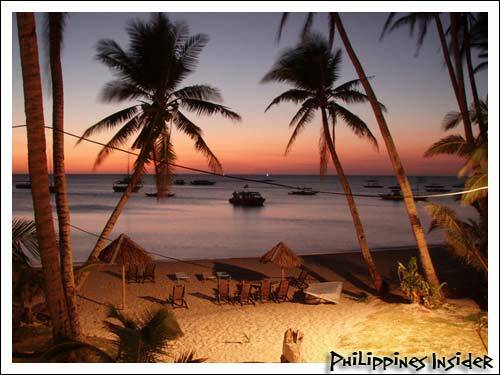 Speaking of beaches, nothing comes close to Boracay located north of the island of Panay. Its white sand beaches are a major travel destination worldwide and it is brimming with tourists during the summer and holiday seasons. Manila, the country’s capital and also a travel destination by itself, can also be found in Luzon. It is the center of commerce, industry, politics and entertainment. Major historical landmarks such as Jose Rizal’s execution site now transformed into a children’s park is found here. Manila also serves as a major entry or exit point to travel destinations world- and nationwide. Just west of Luzon lies a cluster of islands commonly known as province of Palawan. The province has earned its reputation as a major international travel destination due to its pristine white sand beaches. Its most famous gem is the Tubbataha Reef, the archipelago’s second World Heritage Site alongside the Banaue Rice Terraces. While the Tubbataha Reef is another travel destination that should be experience by itself, the province of Palawan boasts of other natural wonders such as the kilometers-long underground river. The Philippines offers a lot more than just ancient and natural wonders. Aside from its beaches and heritage sites, its picturesque towns are home to close to 70 million people known for their smiles and genuine hospitality. It is not surprising that millions flock and make the archipelago their travel destination at least once in their lifetimes.